The fascinating architecture of the famous Mesquita in the city of Cordoba, Andalusia, Spain extends to its interior and the design of its arches in the stunning naves. 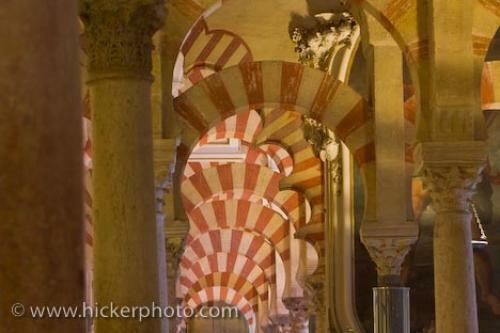 A spectacular sight to behold, the seemingly endless naves in the interior of the Mesquita Cathedral - a famous landmark in the city of Cordoba in the region of Andalusia, Spain. Nave of the original mosque of Abderraman I at the Mezquita (Cathedral-Mosque), City of Cordoba, UNESCO World Heritage Site, Province of Cordoba, Andalusia (Andalucia), Spain, Europe. building at the Mesquita in Cordoba, Andalusia, Spain.